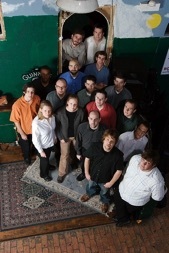 The Stone/Bratt Big Band is a seventeen member group which brings together outstanding musicians from the ever-vibrant Chicago creative music scene. Significantly, the group features big band music that is original, unpublished and crafted by members of the group. Founded in April of 2006, the Stone/Bratt Big Band is the inspiration of two long-time friends: Doug Bratt and his near-namesake, Doug Stone. Stone and Bratt first met in 1999 as members of the acclaimed Northern Illinois University Jazz Ensemble. 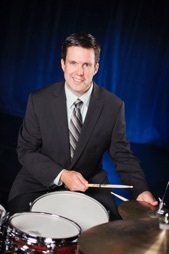 Upon relocating to the Chicago area, Bratt and Stone both became intrigued with the idea of creating a big band of up-and-coming area music professionals to explore, create and foster the growth of new music for the traditional big band format. Most importantly, Bratt and Stone sought to form a catalyst for friends to gather and create music. As they called upon friends both old and new, including many who had been part of the NIU jazz scene, the overriding concern was that members should share a positive, easygoing vibe and possess a passion for playing adventurous music of all kinds. The band’s self-titled, 2008 debut recording, Stone Bratt Big Band, features works composed by SBBB co-leader, Douglas Stone who is a noted saxophonist, composer and a former member of Maynard Ferguson's Big-Bop Nouveau band. Their debut album represents a major step in this musical journey. Not surprisingly, listeners who are fortunate enough to discover the album and this band become part of the band's "extended family" and certainly will share in their evident joy of playing and making music with the very best of friends! Follow the Stone/Bratt Big Band on Facebook for performance dates, recordings and more. The Doug Bratt Group is a dynamic aggregation comprised of some of the very finest Chicago-area musicians. Adventurous, inspired and dedicated to entertaining our audiences, we focus on creating and performing new music, as well as rethinking classic jazz and popular tunes. Beginning with our very first performance in March of 1998 at Pop’s for Champagne (Chicago), the group has been fortunate to perform for the Village of Deerfield summer concert series, the Chicago Cultural Center, Midwestern University, the Northern Illinois University Foundation and the Moraine Valley Foundation, in addition to numerous other venues and events. We love working with young musicians, too! The DBG is available for educational outreach activities including jazz workshops, guest artist appearances and school performances. Workshop topics include: The Roots of Jazz: An Aural History and Performance; Techniques in Jazz: Styles, Instrument Roles and Improvisation and Listen and Swing: Essential Ingredients for Jazz. From club dates to corporate events, school concerts and workshops, the fearless musicianship and joyous energy this group brings to each performance is sure to excite and exhilarate audiences of all types!